Just had lunch with my good friend Roland Lazenby and, as you might imagine, the talk turned to books. Hell, truth be told, it didn't have a lot of turning to do. Roland's newest--of about 60 or so books he's been involved with--will be published in the spring. It's Michael Jordan: A Life and a lot is expected of it by publisher Little Brown (and Jug). Those expectations mean re-writes, re-interviews, re-formating, re-imagining, cutting (25,000 words so far from a 1,000-page book) and none of that's easy. A couple of my favorite passages in the book have had to be cut and re-entered elsewhere. But that's the commercial book world. People like me--who most often publish independently--don't have to do all that forming for a paid audience because we don't care whether you buy the book or not. We just want to tell the story, get it out there and let it seek its own level. The five I've had published so far have done pretty well and my guess is the newest, CLOG!, will do equally well if not better. It's a pretty good book, if I say so myself, and I ain't bashful. 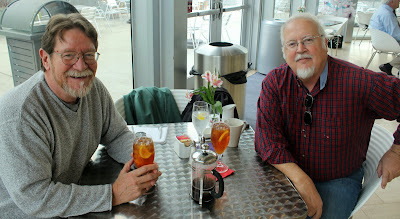 Anyhow, it's always good to sit down with a colleague who's also a friend and often a mentor and just talk. Especially at Norah's at the Taubman, a little bistro downtown that I really like. Tea Party Talk: You Believe What? Throwback Thursday: Street Tennis Anyone? A Bit of Encouragement on the Heels of CLOG! Here's the CLOG! Cover; What Do You Think?